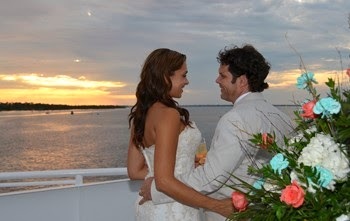 SunQuest Cruises’ SOLARIS luxury yacht was voted the 2013 Best Wedding Venue by readers of Northwest Florida’s Emerald Coast Magazine. This is the third consecutive year to receive this prestigious honor. With the experience of hosting hundreds of weddings, it’s all hands on deck on the SOLARIS with professional staff efficiently handling every detail for the bride-to-be, from planning through implementation. At no additional cost, SunQuest Cruises provides an event planner, to work with the bride, or with the bride’s event planner; a food and beverage director; on-board chefs and servers. The ship’s Captain can officiate the ceremony to marry the bride and groom on the sky deck overlooking the beautiful Choctawhatchee Bay during a scenic cruise. Docked in the picturesque Baytowne Marina at Sandestin Golf and Beach Resort, the SOLARIS is an impressive 125 foot, 3-deck, 5,200 square foot luxury yacht in operation since 2004. Presenting rich mahogany interior features, a full service bar, private bridal suite, sweeping views and friendly staff, a wedding experience aboard the SOLARIS is the ultimate experience for the bride and groom, as well as their family and guests. SunQuest Cruises offers a variety of rehearsal dinner, wedding ceremony and reception options that can accommodate any budget with up to 150 guests. SunQuest Cruises offers public dinner dance cruises year round, is available by reservation to host special events, weddings, private parties, receptions and corporate events. 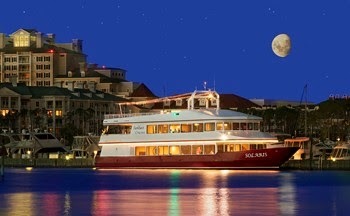 For further information, visit www.SunQuestCruises.com, their Facebook page, or call (850) 650-2519. The Yacht sounds like a place I'll love to renew my wedding vows - romantic! I've been married fourteen years. I can imagine kissing my husband on this luxurious yacht. Congrats on the award and keep up the good work. Great blog riht here! Additionally your web site so much uup very fast!